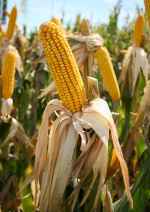 Maize (also called corn or mealies) was the staple grain of the Aztec empire. Maize has been domesticated for thousands of years, and it likely first came into common use in Mexico, spreading to the rest of the world from there. Mexico is still one of the world's top maize growing countries. Corn could be ground into flour and used to make tortillas (a sort of flat bread, sometimes used to wrap a filling to make tacos), tamales and even drinks. Corn has transformed the world perhaps more than any other food. Today it's used not only in food, including candy and of course feeding the cattle that is eaten, it's even used in things like sticky tape and making boxes. How did all this food grow? Find out about Aztec farming here. To add to these three, the Mexicas (people of the Aztec Empire) ate chillies, tomatoes, limes, cashews, potatoes, sweet potatoes, peanuts, and of course chocolate. The Mexicas domesticated bees for honey, and turkeys for meat and eggs, also dogs and duck. They hunted and fished as well, and used animals such as deer, rabbits, iguana, fish and shrimp for food. Even insects, such as grasshoppers and worms were harvested. These various types of meat made up only a very minor part of the Aztec food that was eaten. Large amounts of algae were collected from the surface of the Texcoco Lake water. High in protein, this algae (known as tecuitlatl) was used to make bread and cheese type foods. This algae is still used in Mexico as a fertilizer. 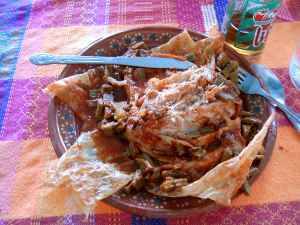 The Aztecs often cooked food bundled in the Maguey plant leaves. This dish is called Mixiotes, and it's still eaten in Mexico today. Different leaves are used because the Maguey population was suffering. One of the greatest gifts to the world from Mexico is chocolate. The cocoa bean was highly treasured in the Aztec Empire. In fact, the bean was used as a currency, as well as Aztec food. Or, in this case, drink. The cocoa beans were used to make a thick chocolate drink, but far different than the hot chocolate we know today. Since they didn't use sugar, the Mexicas added peppers, corn meal and spices. A similar hot drink is still found in Mexico today with corn, known as atole. Though Columbus brought cocoa to Europe in the early 1500s, it was mostly ignored. Hernan Cortes was more interested, and substituted sugar and vanilla for the spices. It became a commercial success. The word chocolate even comes from an Aztec/Mayan word chocolatl. Chocolate actually may have played a part in the fall of the Aztec empire. The Aztecs believed that the god Quetzalcoatl brought the cocoa beans from the tree of life to give to man. Later, the god was banished. It seems that at first the Mexicas believed that Hernan Cortes, the Spanish conquerer, was their returning god. There are some excellent recipes available online. Find a low carb Mixiotes recipe here. There's also a recipe for atole. cdkitchen.com has a unique hot chocolate recipe, a combination of Aztec and Spanish traditions. Above: A Mixiotes dish I ate at Teotihuacan, Mexico. The meat is rabbit, and it's in a red sauce with cactus. Delicious! Living in Mexico, I'm able to enjoy all kinds of great Mexican food. This cookbook (actually, an ebook you can download right away) will bring Mexican food to your own table, whether you live in Mexico or not.